There are few things we love more than a summer bike ride, but nothing will put a halt to that fun quite like a battle with dehydration. It can be difficult to keep yourself adequately hydrated on hot summer days, so today we’ll share a few tips to help you avoid dehydration this season. Drink water as soon as get up in the morning. Thinking about going on a bike ride tomorrow? If so, it’s a good idea to drink about 300 to 500 milliliters of water first thing in the morning. This will jumpstart your metabolism and replace any water your body may have lost while you were sleeping. Continue drinking water in the hours leading up to your ride. Top off your morning glass of water with another 300 to 500 milliliters one to two hours before you head out on your bike. It’s especially important to drink plenty of water in advance when it’s very warm outside. Otherwise, it can be hard to stay hydrated on long rides. Replenish your body with electrolyte drinks once you start riding. When you sweat, your body expels both water and electrolytes. Once you start to work up a good sweat on your bike, drink an electrolyte-based drink that will replace sodium, potassium and other electrolytes as well as water. This will prevent cramps and dehydration during your ride. Drink water even if you aren’t thirsty. Even if you don’t feel thirsty, your body will still benefit from absorbing more water while you exercise. 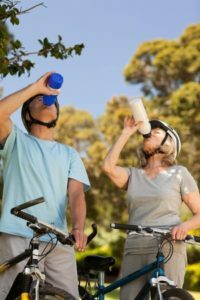 As a rule of thumb, you should generally try to drink about 1.5 liters of water per hour while cycling on hot summer days. Need a hand getting your bike ready for your next ride? Stop by Nantucket Bike shop for a tune-up today!